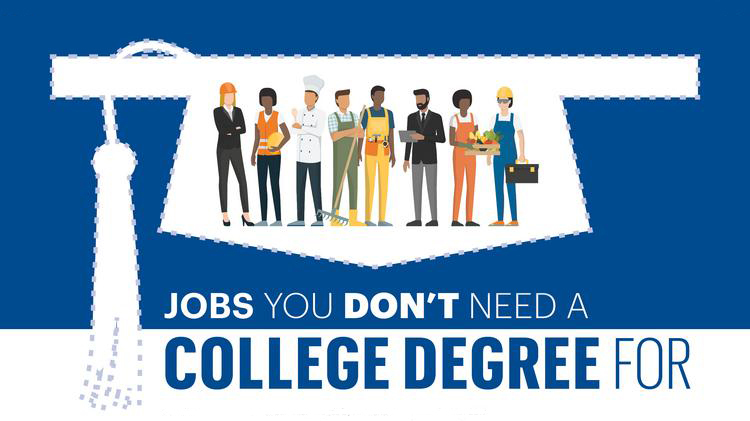 Having a college degree is one of the best and easiest ways to land a job of desire. It is a common observation that students remain concerned about the quality of education they receive, as this is what determines their long term success or their future. However, certain career options do not require a college degree, which means you can apply for those jobs even if you have not finished your graduation. Below, WhiteEssay is going to outline and describe jobs that don’t require a degree. These jobs are not considered low key jobs, as they have good salaries and are great career options. If you are browsing and inquiring about what is the highest paying jobs, we have just found you one. Power distributors and dispatchers, who are also known as system operators, make a lump sum of $82000 annually. Do not fret, as it is amongst those careers that don’t require a college degree. A diploma in a relevant field from a high school is all that you require stepping in and beginning a successful life. The system operators are the people who work at grid stations or power generating stations. They control the flow of electricity to our homes and offices. Their duties include monitoring charts, meter reading and regulating the power flow. They also look after the power generators (equipment) and keep an eye on any indicators of issues that can cause power disruption. If a disruption happens, they respond to that and find the cause to put an action plan in place for quick recovery. We think that freelance writing is one of the best paying jobs. It is due to the fact that you do not need to have a degree or a diploma to become a freelance writer. As the name suggests, a writer writes content or academic papers regularly or occasionally, and legal contracts do not usually bind him. These individuals can decide to write in one area only or can cover a variety of areas writing for essay writing service. They can opt to work with one company or publication at a time or with more than one to make more money. Detectives and criminal investigators are members of the law enforcing agencies, and they work in the public institutions or privately. Detectives can also be criminal investigators, and their job locations vary. It is one of the highest paying jobs without a degree that requires a high school diploma. The median salary for a detective or criminal investigator is $80000 yearly. On the job training is also vested in these positions and many find it as a very thrilling and challenging career. Their job is to investigate the crime by collecting evidence, interviewing suspects and connecting the dots. The ultimate goal is to catch the real criminal and present him for a trial. It is a daunting yet well-regarded position. Postmasters and mail superintendents are amongst those careers that don’t require a degree. The postmasters and mail superintendents’ jobs require a diploma from high school or anything equivalent. Being one of the good jobs that don’t require a degree, they do require years of experience (usually less than five years). Their median annual wage is $75000 which is quite good for a common man. Postmaster and mail superintendent act as managers in the post office. Their large array of duties includes overseeing customer service, hiring and training postal employees, managing mail distribution. With all this, a postmaster also enforces the postal regulations within his working space. It is their responsibility to ensure that the overall post office operations are smooth and there is good coordination amongst all sub-departments. It is another set of skillful jobs that don’t require a college degree. Landscaper and groundskeeper are two jobs that sometimes are confused as one. Where landscaper deals in the horticulture sector, a groundskeeper can help to remove snow and wastes from the ground. A landscaper’s expertise can range from trimming bushes, planting flowers, watering and fertilizing vegetation to patio and walkway construction. The groundskeeper is not limited to greenery work. His work includes maintenance of lawn and keeping pool and fountain area presentable and clean. Some surveys show there will be more than 1,10,000 new job openings in the next ten years with a median salary of over $27000. It is one of the best careers that don’t require college. We see them everywhere, and we need them once every week or two. Joining this profession is not difficult, as a diploma in cosmetology and hairdressing can set you on your way. Yes, you will have to get a license to trade though, and it is easy for you to make around $25000. As a hairdresser, you will cut, trim, color and wash customer’s hair. You will also style their hair to give them a new personality and preserve what they already possess. It is normally all down to the customer’s demand but your regular clients may ask for suggestions once a while. You will need to have good knowledge of hair and chemical types, such as what chemicals to use on which hair. You can also provide service for minor hair and scalp problems. We have gone through seven career paths, and you can decide to choose from based on your interest and inclination. We have tried to keep it relevant and informative for our readers. When an MBA is not worth it? And What are the Best MBA Alternatives?